Danny Weeden, longtime leader of agricultural enterprises in the Pacific Northwest has been named Chief Executive Officer of the Sakuma Family Business. Weeden’s hiring follows a national search for a new leader for the family-owned business. He has over thirty years of experience in the food industry including senior positions with Olympic Foods, Seneca Foods and Chef Reddy Foods. Most recently he was executive vice president, general manager and chief financial officer of the grower-owned cooperative Oregon Cherry Growers. The beginning of a new year is always a good time to reflect on the past and plan for the future. That’s what we are doing at Sakuma Brothers Farms and I wanted to share some of our thoughts with you. 2014 was without doubt one of the most difficult and challenging years in our eighty years of family farming history. But as we look back, what we see is an incredible outpouring of support for our family and our farm. From the crowds waving the “I Love Berries Support Sakuma Farms” signs, to the support at the courthouse, to the overwhelming number of comments and letters of support, to the tremendous response to our free berry picking days — all this has given us the strength and fortitude to keep going. And it has has helped to spread the truth. Your support has caught the attention of the media, the community, and those who may have been confused or swayed by the untruthful attacks on our family farm. We will never be able to adequately express our deep appreciation to everyone who participated in this support. Our thanks go out in particular to Amy Cloud and Kristen Hinton for all they have done to get the “I love Berries” movement going for us and our farming community here in the Skagit Valley. Since about 2010 we have been faced with an increasing shortage of farm labor to pick our fruit. More than most other berry farmers in the area, we have relied on handpicking rather than machine harvesting to meet the demand of our customers. This has come at a significant cost. In 2011 and 2012 we had to leave almost a million pounds of berries to rot because of the labor shortage. Reluctantly, we opted to use the federal H2A Guest Worker program to help fill the gap. The H-2A program has been around for many years, and allows farmers to bring in legal temporary guest workers from other countries to to supplement the available domestic workforce. Farmworker Justice and other organizations aimed at union organizing have long opposed the H-2A program on the untruthful grounds that there is no labor shortage in agriculture. As we were the largest farm in the region to use the H2A program, these organizations sought to make an example of us to discourage others from using the program. The strategies used against us followed a playbook well established by so-called “worker centers.” We were accused of terrible working and living conditions, of stealing wages, of discrimination, of failing to protect our worker’s rights. This is not to say we have always done everything right. We have made some mistakes along the way, but we have improved greatly as a company and are committed to continued improvement. The current boycott efforts against our farm are not being carried out by the farm workers. Instead, outside agitators, including Western Washington University students, have attempted to fabricate the the impression that this is a worker movement. It isn’t. While disheartening and frustrating, the boycotts have largely been ineffective as customers and consumers began to understand the underlying forces at play. Farm workers return to Sakuma year after year because of our high piece-rate wages that can far exceed minimum wage. In March, the Washington State Supreme Court will decide the issue of whether agricultural workers who are paid on a piece-rate basis, must receive separate and additional pay for the ten-minute rest breaks that are provided within every four hours of work. Piece-rate is used throughout agriculture because it incentivises employees by awarding harder-working and more productive workers with greater earnings. The Supreme Court’s decision could have a drastic impact on farmers throughout our state. A finding by the Court that farm workers who are paid on a piece-rate basis must be paid a separate and additional amount for the time spent during their rest breaks would effectively discourage employers throughout agriculture from making incentive-based compensation systems available to their workers. It’s another example of how those claiming to be protecting worker’s interests would once again hurt them. Farmers who offer these workers employment opportunities are the real friends of farm workers. Faced with these challenges, we enter 2015 with one big difference: we know that our customers, our friends, our neighbors, and our community are solidly behind us. This is a huge difference and makes it possible for us to face the challenges with renewed resolve. We will keep you informed of what is happening in this on-going situation, If you wish to receive our email updates, you can register to receive them through this link or by visiting www.sakumafacts.com. Link to Capital Press September 10, 2014 article on Sakuma Farms. The arrival of the July 4th Holiday marked the completion of the 2014 strawberry harvest and another outpouring of community support for Sakuma Brothers Farms. Mother Nature worked her magic this season with near perfect growing conditions that helped develop beautiful, great tasting berries that were in high demand among consumers stopping at the Market Stand or shopping in numerous grocery stores locally and beyond. Clearly based on recent public displays of support, the local community understands and appreciates the efforts by the Sakuma family over the past year to provide workers with jobs that provide some of the industry’s highest wages and free housing. The growing support from the community is real, it is broad and growing. Given this, last week the company opened up one of the last strawberry fields to the public to pick their own berries for free as a small sign of appreciation for their support. Even this gesture of kindness by the company to support the community was met with more court actions by the union activists. Hiring local workers was the top priority for Sakuma Brothers Farms as the season progressed and more berries ripened for picking. Despite continued antics by the labor activists to attempt to destroy the Sakuma family’s reputation, more than 150 local pickers were hired, the harvest progressed smoothly and demand for berries was strong. More good news occurred just prior to the start of the holiday weekend when a Washington State Superior Court judge denied a request by the union front group to force Sakuma Brothers Farms to immediately hire workers for the upcoming blueberry harvest and house their families in the company’s free housing. Hiring for the blueberry season will occur later in the month as the blueberry harvest nears. The July 4th holiday provided local residents in Skagit Valley another opportunity to show their support for Sakuma Brothers Farms. At the Logger Rodeo Parade in Sedro-Woolley, the longest running Fourth of July celebration in Washington State, the Farm Bureau’s parade entry supported Sakuma Brothers Farms. Behind a cavalcade of trucks and tractors, farmers, families and supporters marched together to demonstrate their support for Sakuma Brothers Farms and were cheered on by thousands along the parade route. While the company has made numerous changes to the way it does business, the union front group continues to make unrealistic demands that fail to recognize the efforts of the company. Their resistance to work with Sakuma Brothers Farms and their continued calls for a boycott are clearly frustrating the local community. Our family thanks each and every one of you for the outpouring of support you provided to our family at the Berry Dairy Day Parade last weekend. It became visibly apparent that the Skagit County community continues to embrace the agriculture foundation of our community. Every aspect of last weekend was endearing to our family, to our employees, to all of the Skagit Community, and to all the parade spectators. You positively touched a lot of people. As a small token of our appreciation to the Skagit Community, to our loyal supporters, and to our employees we have opened up a 30 acre strawberry field that is located at the northwest corner of Josh Wilson Road and Avon Allen Road (S-2), for all who want to pick fresh strawberries. We have by-passed this strawberry field because we do not have the required labor force to harvest the 300,000 pounds of fruit that is now in this field. We will keep this field open to all of you from Friday, June 27 through Tuesday, July 1. We will disc this field starting July 2. Please bring your own containers and enjoy the strawberries. BURLINGTON, WA (June 3, 2014) – Despite a worsening labor shortage in Washington State, Sakuma Brothers Farms announced today that it has decided to not participate in the federal government’s H-2A Guest Worker program in 2014. The company had applied for the program but notified the federal government over the weekend that it has decided to not participate. Washington State agriculture is facing continued shortages of able, willing, qualified and eligible workers. Sakuma Brothers had to leave more than 900,000 pounds of berries unpicked in the fields in the last two years because it did not have enough labor to pick the highly-perishable berries which necessitated its decision to participate in the federal government’s H-2A guest worker program. While the Guest Worker program provided the company with a stable supply of workers last year, it caused some unrest in the community. Even though Sakuma Brothers accounted for less than one percent of all the guest workers employed in the State of Washington in 2013, people who opposed the H-2A program protested Sakuma’s involvement. “It was sobering to witness the protests against our family-owned business and hear calls for a boycott against our berries,” said Sakuma. He added, “But, even though we have been in business for nearly 80 years, we listened to our critics and we recognized that we could do better. • Improved Housing – The Company has invested thousands of dollars to upgrade its worker housing units, centralized shower/restroom facilities and worker housing grounds. • Supervisor Training – The Company trained every supervisor and farm manager to ensure they can communicate effectively and manage responsibly. • Enhanced Food Security – The Company has improved security throughout all its properties to protect the safety of its food and keep its employees safe and secure. By far, the biggest news to many in the community is Sakuma’s decision to not participate in the H-2A program in 2014. Given the compressed time period to identify and hire employees, Sakuma Brothers will work with various Skagit County community groups to help recruit local workers to apply for employment to pick berries. The minimum wage for all berry pickers will be $11.87 per hour for those who do not exceed this per hour guarantee through piece rate calculations, as workers will be paid the higher of the two calculations. The $11.87 minimum wage is the same wage set by the federal government for Washington State for all H2A foreign and domestic workers in corresponding employment. It is also higher than the Washington State Minimum Wage, currently at $9.32. 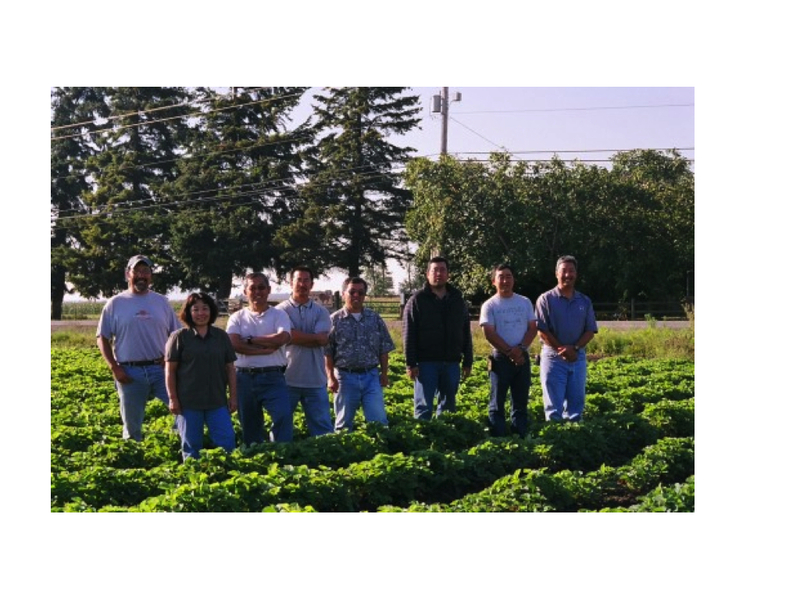 The Sakuma family business is committed to working with local farm worker support groups to engage the Washington State Congressional Delegation to seek a solution for a legal and stable workforce. The labor dispute saga continues as we continue into another harvest season; our focus has not changed, to grow a good crop and to harvest a good crop. Sounds like a simple solution and 50 years ago it was a much simpler solution. When our parent’s generation farmed they struggled through the prejudices of the aftermath of WWII and they successfully built a credible business, which they have passed to our generation. Our generation has worked within a supportive community and rural setting, although living on the I-5 corridor has brought a number of challenges. The growth in our community has changed the demographics of our community and the continued growth of the regulatory oversight within the farming industry has changed the farming playing field immensely. Add to this playing field the ever increasing modern technology of information transfer and every business is faced with constant oversight. It is my observation that the ground rules were much simpler in the 20th century; where truth was supported by fact and a reputation was earned and not erroneously thrust upon a person or organization. The question I would have for today’s readers is “where does abuse stop and personal responsibility begin?” The concept of: “it is on the internet, it must be true!” has clouded this line considerably. Our family business continues to receive negative inputs via email, blogs, facebook, published material, and chanting crowds about how we abuse our workers and the inequity of using the H2A program to displace our domestic work force. Let me take this opportunity to give you our basic strategy; it is simply to grow a good crop and to harvest a good crop so we can successfully pass this family business down to our next generation, into perpetuity. I understand your versions of our family business strategy and I can actually understand how you arrived at your conclusions. It is my belief, until you understand the complexities of operating within the agriculture industry and the complexities of operating within a family business you will not be able to discern clearly where abuse stops and where personal responsibility starts within our family business. I am not asking you to change your position, nor your tactics; as I personally spent 26 years in the Army fighting to make sure we all have the rights you are exercising. My only ask is that you consider taking a position that places the farmer and the farm worker in a win – win scenario and not in an adversarial position; neither of us will survive without each other. The farmer and the farm worker have the same desired outcomes; we both want stability, we both want all employees to have the legal right to work, and we both want a fair wage and a positive work environment. Our family business is committed to do our part. If you truly support the plight of the undocumented farm worker; seek immigration reform with your federal delegation. Specifically, demand a legal path to work for the undocumented domestic worker. On Monday, April 21 my son Ryan and I attended the forum at Skagit Public Utilities District put on by the Latino Civic Alliance. The purpose of this meeting, one of a series conducted by this valuable group, was to help build understanding around the issues of farm labor. The concerns about the H2A guest worker program were a primary focus. This is the program that we used for the first time last year and which triggered the activism against our farm. There were many in the audience who wanted to become informed citizens and there were some who had concerns about the current systems. As the Skagit Valley Herald news article about this meeting pointed out, sometimes it was hard for those inside to hear the speakers for the noisy protest going on outside. This protest, with Sakuma as the primary target, involved mostly Western Washington University students, who I believe are sincerely interested in improving the conditions for farm workers. Unfortunately, those outside did not come inside and and take the opportunity to respectfully learn about these challenging issues. While I applaud those who have opinions to express and who get involved in working for improvements, it also seems that some effort should be made to learn from all sides and to get a basic understanding of the situation. Nina Martinez, the Vice Chair of the Latino Civic Alliance administered a respectful, open and focused meeting that approached problem solving in a peaceful and collaborative manner. Great job! By the way, I’m new to this blogging thing and this is my first attempt. But I think it is important that the community and those interested in solving the issues of farm workers hear from all perspectives. Particularly since our farm, without any intention or desire on our part, has been brought into the forefront of this issue. Is There Really a Farm Labor Shortage? Union front groups and worker centers organizing the boycotts and labor action against Sakuma have loudly disputed that we and other farmers are facing labor shortages. Over the past two years Sakuma has lost over 900,000 pounds of berries due to a shortage of farm labor, which is why Sakuma in 2013 decided to bring in guest workers under the H2A guest worker program. This program REQUIRES that domestic workers who are able, willing, capable and eligible be hired before guest workers can be brought in. If we could find enough who qualify, we would definitely not bring the guest workers. For those who dispute our statements that there is a shortage of farm workers, we refer you to the Yakima Valley Herald, which in an April 22, 2014 story, indicated that the shortage of the past few years is become clear even earlier than before. in 2006, growers hired 814 foreign employees statewide through the H-2A visa. In 2013, they hired 6,194 workers. The complete article may be found here. State economists last month reported a 5.2 percent agricultural labor shortage — the first time since 2008 that March showed a shortage at all — fueling concerns that the lack of orchard workers is worsening. The shortage is calculated based on how many workers can be recruited compared to the number that growers actually sought. For example, a grower who wants 20 workers but can find only 19 would report a 5 percent shortage. Industry groups suspect the labor gap could get worse this year. Officials estimates aren’t due until summer, but growers are whispering of another record apple crop, perhaps topping the 130 million boxes of 2012. To make up for it, growers are increasingly turning to foreign guest workers through the federal H-2A visa program, which allows U.S. employers to hire foreign workers on short-term contracts as long as they can demonstrate that no domestic laborers wanted the jobs. This year for the first time, growers asked for contracts that start in January for pruning help, said Dan Fazio, executive director of the Washington State Farm Labor Association, which represents more than half the H-2A employees in the state. “We’ve never had anyone cross workers that early,” he said. When labor activists launched their campaign against the federal guest worker program by targeting Sakuma Brothers Farm, it left many confused and wondering this family and their farm operations. We encourage you to get to know the Sakuma family and their remarkable history–truly a Japanese-American success story. You can download the pdf here–please forward it on to all those interested in knowing the truth about the Sakuma family. The story can also be found on this website on the menu bar above. Current board of directors of Sakuma Brothers Farm.